These are perfect mashed potatoes! A super simple technique makes all the difference – get wonderfully creamy mashed potatoes each and every time. I fully admit to being a carbaholic, and the holidays feed right into my weakness. Sure there’s a turkey at Thanksgiving, but I typically only eat a small piece and then load up on mashed potatoes, some type of sweet potatoes, stuffing, and no less than two dinner rolls. And at Christmas and Easter? Give me a small piece of ham, or better yet, throw that small piece of ham on a roll for a sandwich and then put the pan of scalloped potatoes right next to me. 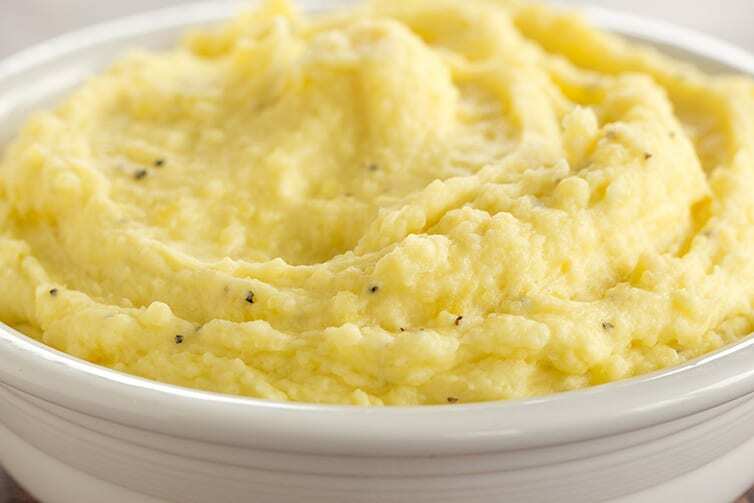 Given my love of side dishes and carbs, it goes without saying that perfect mashed potatoes are an absolute must for me. 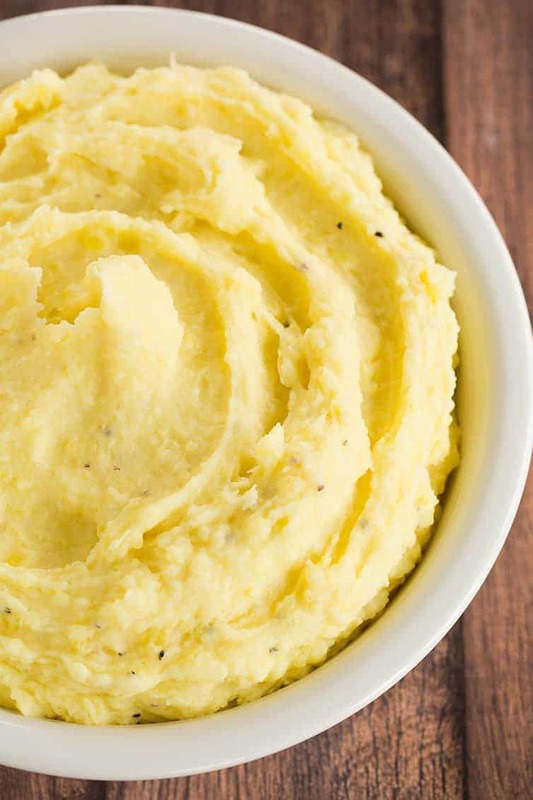 It took me awhile to nail down the technique for truly magnificent potatoes, but once I uncovered it, I’ve never made mashed potatoes another way! 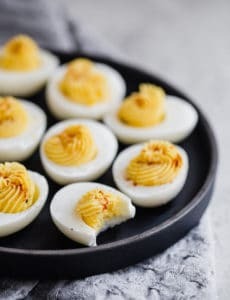 The best part is that they are incredibly easy to make only requires a few ingredients. 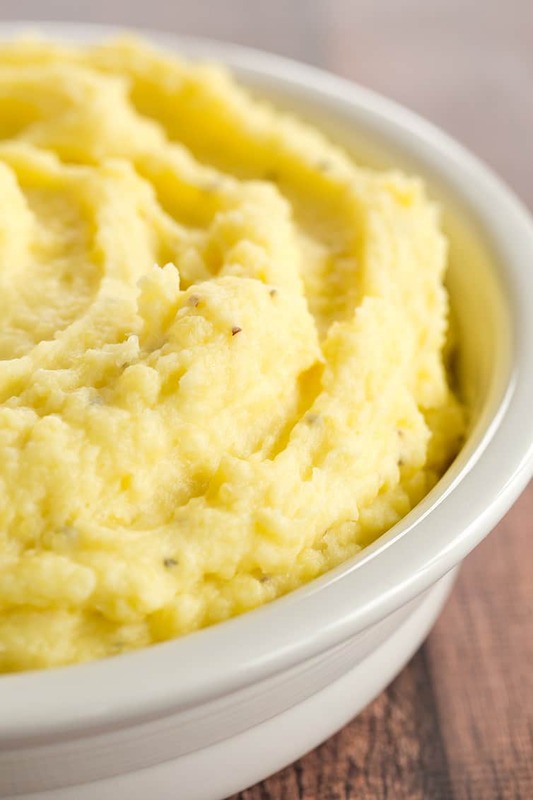 Watch How to Make the Best Mashed Potatoes! I have found that Yukon gold potatoes make for the creamiest mashed potatoes (it’s an added bonus that they have a gorgeous golden hue). Aside from that, the real secret I’ve found is to have the butter and milk melted together and warm before adding them to the boiled potatoes and doing your mashing. This seriously makes all the difference; I couldn’t believe it the first time I did it; the mashed potatoes turn out so much smoother and creamier. A quick make-ahead note! Two years ago, I tired of trying to time my potatoes with the turkey being done and carved, so I started making them early in the day and keeping them in the slow cooker on warm. 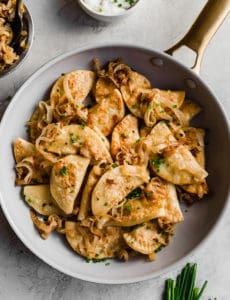 It works like a charm and now I make them in the morning before anyone gets here and they’re piping hot whenever we sit down to eat! 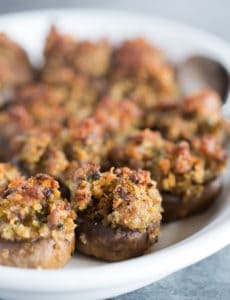 I’ve added a note below the recipe on my tips for keeping them warm, so be sure to check it out. My family clamors for these mashed potatoes each and every Thanksgiving, so depending on how many people we’re having, I make either a triple or quadruple batch to ensure there is enough for everyone take pack up with their leftovers! I love that these are super creamy but still retain a good bit of texture and some chunkiness – the best of both worlds when it comes to mashed potatoes. I hope you’ll give this version a try and let me know how you liked it! A super simple technique makes all the difference - get wonderfully creamy mashed potatoes each and every time. Bring to a boil and cook until the potatoes are very tender. Meanwhile, heat the butter and half-and-half in a small saucepan over low heat. Drain the potatoes and return to the pot. Mash up the potatoes a little with a potato masher. Add the melted butter mixture a little at a time and use the potato masher to combine. Once it has all been added, use a wooden spoon or spatula to give it a few stirs to combine completely. Stir in the salt and pepper and stir to combine. Serve immediately. Half and half is a common dairy product sold in the U.S. If it's not available where you live, you can substitute half whole milk and half heavy cream. You can keep these mashed potatoes warm in a slow cooker if making for a holiday dinner. Splash some cream on the bottom of the slow cooker, add the mashed potatoes, and then a splash of heavy cream on top. Keep the slow cooker on warm and stir occasionally. If the potatoes seem dry at any point, then just stir in some additional cream. These are very well seasoned (there's nothing worse than bland mashed potatoes! ); if you're watching your salt intake, you may want to cut back on the salt to start and then add more to taste. This recipe was originally published on November 22, 2011. 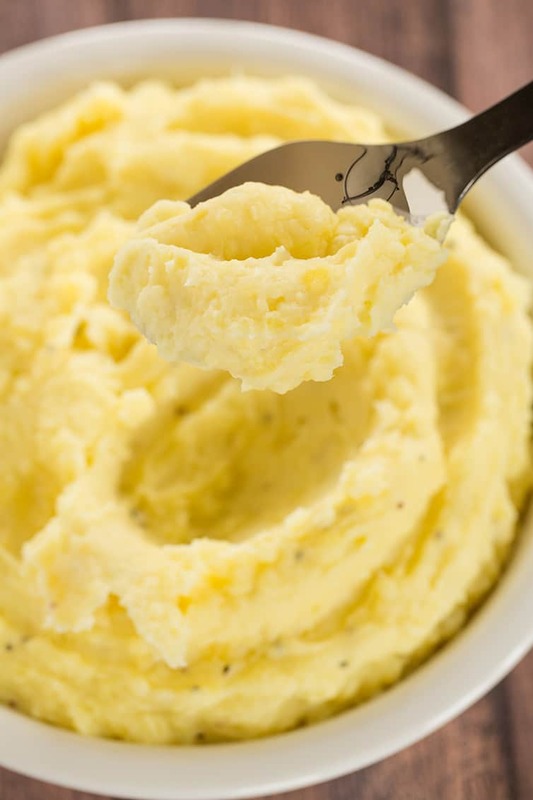 Great tips for the perfect mashed potatoes. I Love to add a whole roasted garlic bulb to my batch. Now it’s perfect! thanks for the tips! Any recommendations on gravy to serve with this? I’d love to bring it to a friendsgiving but I feel like if you bring mash potatoes you need to provide gravy! This sounds so good! I’ve loved mashed potatoes since I was a little kid. When I was turning 6 mom asked what I wanted to eat for my birthday and I just wanted a plate of mashed potatoes! I got them too!!! Have been a life long fan of mashed potatoes. One of the first things about them is the peeling part — just buy yourself a good OXO peeler and its not such a bad job. With this little item, I don’t mind peeling at all. I do like to add garlic — powder sometimes, minced other times. And another things that works really well is sour cream or French Onion dip. Such good flavor, almost make you weep its so good. There’s no such thing as bad mashed potatoes unless you put pean in them, then you should be whipped for ruining them!!!! !